thepokerdb, founded in February of 2005, is the oldest, biggest and most popular multi-table tournament (MTT) tracking site on the internet. Originally located at thepokerdb.com, the site moved to Bluff Magazine in March of 2007 after being acquired by BLUFF Media. The site houses stats on more than five million online poker players from PokerStars, Full Tilt Poker, Bodog Poker, UB, Party Poker, Absolute Poker and T6Poker. The concept behind thepokerdb is pretty simple: keep track of every scheduled MTT played on the major online poker sites. The site does an admirable job of this seemingly simple but ongoing task. For all sites except for Party Poker, updates are typically processed within 10 minutes after tournament completion. This means that only minutes after you win a tournament, you'll be able to see the results posted online at thepokerdb. In all, thepokerdb has records of over one million tournaments in its database. So, what does thepokerdb do with all of this data? It compiles it and attempts to present it in a manner as useful as possible for you, the player. There are a few different ways to look up data on thepokerdb. 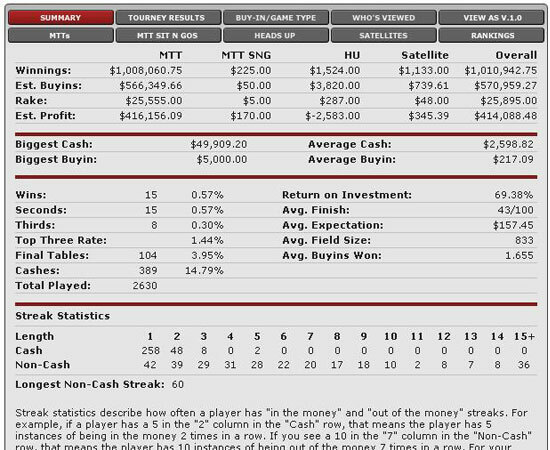 The data on thepokerdb defaults to Jan 1st, 2006 on (although PokerStars has a fair amount of 2005 data in thepokerdb), so this is a reflection of Bdbeatslayer's summarized statistics for Jan 1st, 2006 on. As you can see, this player has been quite successful in PokerStars Multi-Table Tournaments, cashing for a total of over $1 million dollars. Of course, it's also cost a fair amount in buyins and rake for that sort of play volume, so this player has put in nearly $600,000 in buyins and rake. But despite his expenses, Bdbeatslayer has made over $400,000 on PokerStars in the last two years or so over the course of 2600+ tournaments. The other info such as Average Buyin, Average Finish and others can really help you to gauge the play and experience levels of others at your table. In addition the Player Summary tab, there are nine other tabs for you to explore for each and every player. At first, the sheer volume of information available on thepokerdb can be overwhelming, but once most people get used to it, they find that it's pretty easy to navigate and to find exactly what you want in short order. So, what do people use this information for? Typically, three main uses stand out. First, a lot of people use thepokerdb to keep track of their own statistics. It can be really taxing to write down your finishing spot, buyin, cash amount, date, etc for every tournament. It's much easier to let automated software like thepokerdb keep track of everything for you and simply reference the website when you're curious about your stats. That way you don't have to wonder how much you're up or down from tournaments or cash games -- you can get a precise look at your game as you improve over time. 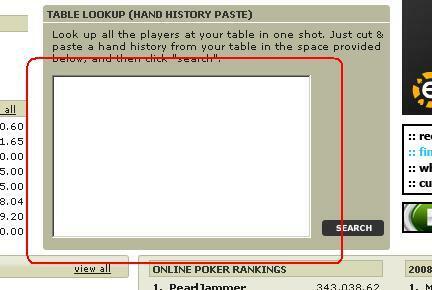 Second, players use features like the hand history paster to look up their entire table at once. It greatly reduces the need to type when you're busy trying to concentrate on your table late in a big tournament. But a quick look at the rest of the table's stats can often give you a snapspot into the poker ability of the rest of the table. While stats don't tell you for sure whether someone is good or bad at poker because of the luck factor inherent in poker, more often than not, stats will give you an accurate picture of your opponents. Third, fans of online poker use thepokerdb to study the best in the game. How do the top-ranked players do it? What do they play and where are they making all of their money? It's also impressive to look at players like "lilholdem954" on PokerStars and see his 1.65 million in cashes, along with his 1 million on Full Tilt Poker and 315,000 on Party Poker (he only had part of 2006 to paly on there!). So he has nearly 2 million dollars in online poker cashes, not to mention his WSOP Circuit win in Indiana last year. The stats on thepokerdb can be awe-inspiring to players who are just starting out in poker and many players use stats to gauge their progress as they begin their quest to join the upper-echelon of the online poker world. 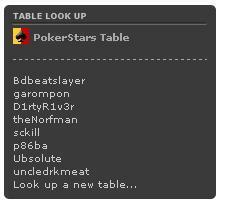 Overall, thepokerdb is an invaluable tool for online poker multi-table tournament players. Even if you only use the database a few times a year, it can be extremely valuable to have subscription-level access in the right situation.